Home staging techniques are aimed at creating a desirable home that will hopefully sell faster and at a higher price. The principle belief behind staging is that creating a clean, simple and somewhat generic looking home makes it more appealing to potential buyers. Learn how to stage your home to various degrees to help facilitate a sale. 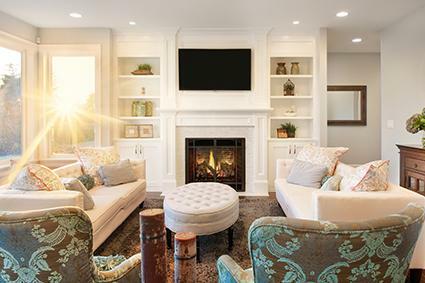 Home staging can be done on several different levels, depending upon the current condition of your home, how your home compares to others nearby and the amount of time and money you are able to put into it. There are several components, however, that most homeowners can undertake no matter what other steps they may also feel are necessary. Sometimes it's worthwhile to remove some of the existing furniture. Making the house look a bit empty also makes it look bigger, and spaciousness often determines the success of a staged home. Typically, the larger a room appears, the better it looks. It also gives potential buyers a better look at the construction, fixtures and architectural details. The furniture layout should create an impression of openness and comfort. 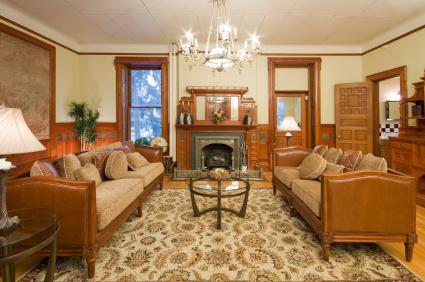 Take a look at the room and the existing furniture. Create one or two conversation areas in the living areas, to inspire the idea of comfort and intimacy. Declutter work areas, removing extra tables, lamps, filing cabinets and books to give the impression of a streamlined and efficient work space. Remove side tables from bedrooms to help make the bedroom appear larger and let the potential buyer feel the space is less personal to you, and more open to being filled. Remove or rearrange any additional end tables or accent tables from the sides of rooms. The idea is to present several blank or empty wall areas in the room. This will make the room appear to be larger and ready for anything. 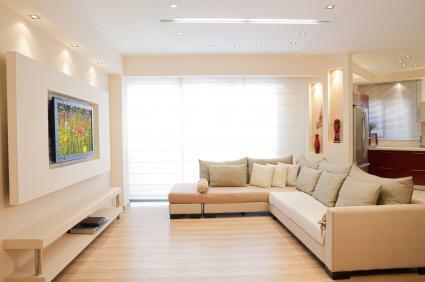 To help create the look of more space, you may also want to relocate larger items and replace them with small ones. Using a small end table in place of a coffee table will create the look of more space between seating areas, while also creating a more intimate look. If the paint in your home is faded and scuffed, or if you've used dark or intense colors, you may want to think about repainting. It's amazing what a fresh coat of paint in a neutral color can do. Everyone's style is different, and people walking through might be turned off by your color choices. A lighter paint can freshen up the space and will appeal to more people. Neutral is always best when staging a home. In addition to this, if your home is filled with a riot of different accent colors, consider replacing or removing some. Put neutral slip covers over your throw pillows, or put neutral slip covers over brightly colored couches or chairs. Don't go for stark white; cream, tan or taupe will help make the room appear warm and inviting, while still remaining neutral. Remove any bold or brightly colored window coverings as well; keep window coverings to the barest minimum; enough to give privacy but not to put a personal stamp on the room. Keep any window coverings in the retracted or raised position to let in as much light as possible to the room. 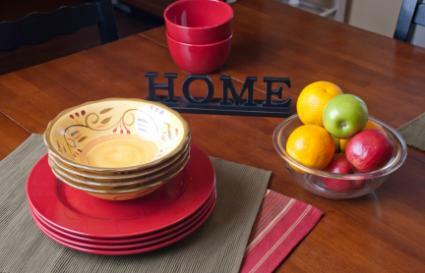 Small amounts of the colors yellow, green and red are often thought to inspire buyers to feel at home in a space; consider setting out some bowls of fresh fruit and either set the table for a meal, or set out a few bowls or plates on the kitchen table. The combination of these colors with the use of plates will help make a potential buyer feel comfortable and at ease there. 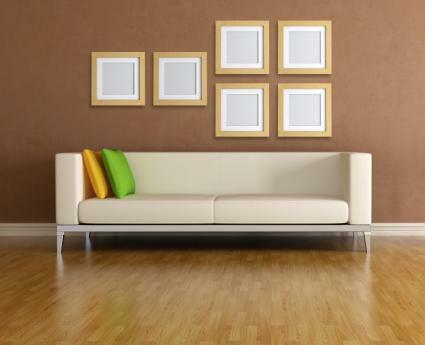 If you have a lot of personal and family photos covering your walls, consider removing them and replacing them with either mirrors, generic pieces of art or even empty frames. The idea is to give the potential buyer ideas for how they could use the space, but not to turn them off with the thought that this space belongs to you. It's fine to arrange large groups of frames on a particularly large, empty wall or to simply hang two or three large mirrors in a space. Mirrors are particularly a good idea in small rooms; they will reflect the existing space, giving the buyer the idea that the room is larger than it actually is. While you may appreciate scattering little personal items throughout the home to make it feel more like yours, potential buyers won't necessarily feel the same way. The same goes for things like appointment calendars, children's artwork on the fridge or little chalkboard messages. Tuck these things away, or hang them from the insides of cabinet doors so they're still accessible, but out of the eye of the buyer. If you have niches or built in shelves in the room, place a single item in each one to draw attention to the areas. Use generic items whenever possible and avoid placing something personal in the space. Depending upon the state your home is currently in, you may want to undertake a few larger projects to help show it off to its best advantage. These aren't always necessary; sometimes the expense outweighs any potential benefit from buyers. Weigh these decisions carefully before proceeding. Painting the exterior of the house is a big project, but one that can make it look significantly more appealing to potential buyers. It will create a great first impression and make the house look well-taken care of. Old, outdated fixtures such as faucets, cabinet and door hardware, and lighting should be replaced and updated. Modern lighting and contemporary light fixtures are small details that make a big impact. Nothing turns people off like a dirty, stained carpet. If you have a carpet that falls into this category you'll want to think about replacing it. No doubt that whoever buys the home will have to replace it and they'll be thinking about the cost. When they're putting in an offer it will likely be a factor in how much they decide to spend. It's important for floors to look as good as everything else. Basic yard work like mowing the lawn, raking the leaves and placing some flowers or decorative touches near the front entrance will create welcoming curb appeal. First impressions are vital when selling a home and making the outside look clean and well-cared for will immediately interest potential buyers. It's very important to make repairs wherever necessary. Leaky faucets, loose cupboard doors and broken tiles are easy to fix and should be done before anyone comes to look at the home. They may seem insignificant, but to potential buyers it makes the place seem rundown. Spending a small amount of time and money taking care of these little jobs can result in higher offers. Some people think it's a waste of money to put a lot of cash into a home that's being sold, but one must weigh the cost against the potential gain. Building a nice deck, replacing heating and air-conditioning units and putting in new windows can increase the value of the home. When selling a home it's important to make it look as good as possible. When it looks its absolute best, people are more likely to put in higher offers. Properly executed staging leads the eye to attractive features while downplaying flaws, hopefully resulting in the highest selling price possible.